My work is mainly concerned with developing novel algorithms to understand how tumors affect tissue texture images. Different medical imaging modalities tend to characterize tissue with diverse types of textures, and there is no single approach to analyse all textures. A wise approach would be to investigate heterogeneity in tissue texture for signs of abnormality. A number of novel texture analysis techniques were developed to detect and differentiate between tumors subtypes early, and further assess their progression or regression. CT image and corresponding fractal dimension parametric images using the differential box-counting and fractal Brownian motion algorithms. [left] Original CT image and corresponding noise (indicated by yellow arrow), [right] horizontal profile along the middle region of interest for reconstructed clean and noisy CT image versions. In another work, a different type of texture was dealt with for the purpose of developing an automated system for improving histopathological meningioma brain tumors discrimination acquired invasively via digital microscopy modality. Histopathological texture usually has a macro or coarse structure where the cell nuclei color, shape and orientation defines the general texture structure and play an important role in the feature extraction process (more info) and for automated classification (more info). Meningioma histopathological images and corresponding fractal dimension parametric images. 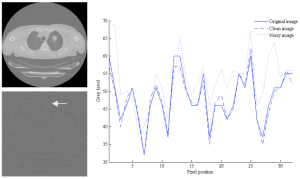 Multiresolution fractal slice maps referring to, respectively, Nakagami shape and scale parametric voxels of radio-frequency ultrasound images, where blue regions indicate tumor response to chemotherapy treatment. 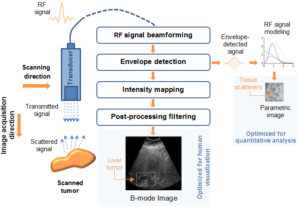 Ultrasound radio-frequency tissue characterization via B-mode versus parametric imaging.